Feel free to make your own. Every time you decide to not QQ, god saves a puppy. I lost it on the bird one second to last. lol. I'll take credit to 2 of those. 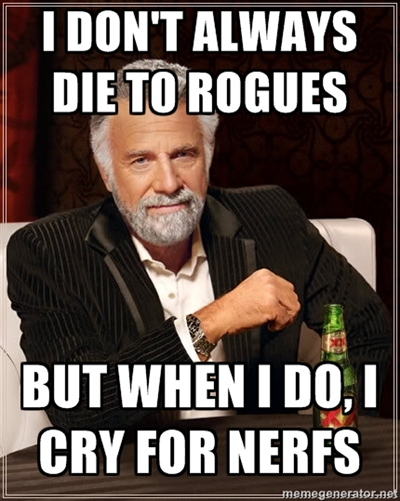 I played the rogue class....before it was useful. Plays Marksmen - Doesn't use Vampiric Munitions. That is totally my face while pwning with EM/SM! Last edited by Bleeds; 10-07-2011 at 04:38 PM. Last edited by Cromagis; 10-07-2011 at 04:48 PM. Your opinion is wrong and you should feel bad for sharing it with the world. 11/11 HK(World top 10), 4/4 ROTP, Greenscale/RoS Current-Content Conqueror, GP Cleared, TDH Cleared. Prestige Rank 8 in a weekend baby. This right here... no words can express my emotions. I've probably looked at it 20+ times since it's been posted. You sir, I shall take as my bride. I just want to be able to survive for 10 seconds when having 2 dps on me, I don't think that's too much to ask for. Glad to be of service! Last edited by Sadarova; 10-07-2011 at 10:46 PM. Dear Admin, please nerf rock because it is overpowered and takes no skill. Paper is fine, they just need to learn to play their calling. -Scissors. Last edited by Nightwish; 10-07-2011 at 11:01 PM. lol'd at 'guys we should disable wardrobes' one. Last edited by Violacea; 10-07-2011 at 11:01 PM.